A lot happens in the opening moments of Burial at Sea: Episode 2. You'll meander through a Disneyfied version of Paris, one that's a garlic garland short of full stereotype; be threatened by Atlas back in the post- Episode 1 version of Rapture; and discuss pseudo-quantum science with an incorporeal Booker. 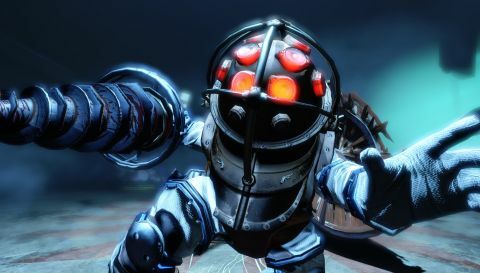 As a concentrated dollop of Bioshock lore, it's alienating but also strangely liberating. Halfway through Infinite, we started to jump the infini-sharks, now the game is willing its players to give in and enjoy the view. This time, you're playing as Elizabeth. Only, for reasons directly tied to the opening whirlwind of plot, it's an Elizabeth that's no longer omniscient, or able to open tears. What she can do is bonk splicers on the back of the head with a Sky-Hook—a trick that comes in useful as you work through more remnants of Fontaine's department store/sunken prison. Significantly more fragile than Booker, Elizabeth has no shield and a limited set of weapons. Stealth is the focus for the first time in the series, and the new weapons and plasmids have been designed for that purpose. The most useful of these is Peeping Tom, which doubles up as both X-ray vision and invisibility, but you'll also find tranquiliser darts and a selection of lethal weapons that provide options when sneaking fails. As a set of systems, the stealth is simplified and exaggerated, but nonetheless entertaining to play with. The near-sighted splicers suggest that Ryan's objectivism failed to attract any opticians, so vision is less a factor in discovery than noise. As Elizabeth crouch-walks through the levels, she won't raise any alarms on regular surfaces, but shattered glass and water puddles produce an almost comedic cacophony that alerts anyone in the vicinity. Although it's not the most elegant introduction of stealth, it works because of the pacing and smooth escalation of difficulty. Episode 2 is much slower than Episode 1's frantic resource scavenging, and that more deliberate pace gels well with the series' emphasis on fully exploring its environments. More than that, though, with the focus no longer on all-out combat, I found those moments when I was forced to go loud—pulling out the shotgun to blast my way out of danger—a refreshing change, rather than an increasingly stale necessity. It turns out that deranged magical junkies aren't the smartest of pursuers, so escape from their immediate vision and they'll quickly lose track of your location. In the more open areas this can be as simple as leaping towards a ceiling hook, at which point you can land in a crouch behind the nearest splicer to deliver an unseen melee attack from behind. Here, it feels like an incredibly basic version of Arkham's gargoyle sections, but the satisfying and speedy swooping across rooms still nicely punctuates the periods of caution. With no Booker to aid, Elizabeth no longer spends her time tossing ammo and coins. There are still locks to be picked though, and that means a mini-game. As with the other new systems, it's a pretty basic interaction. The pick automatically moves back and forth a series of tumblers, requiring you to make a selection. These can't be failed, but certain tumblers are colour-coded. Hit a red one, and an alarm goes off, drawing any nearby splicers. Pick a blue one, and you're given a noisemaker dart—useful for distracting groups of enemies, or the unkillable Big Daddy that roams an early hub area. Thorough exploration rewards with plasmid upgrades that drastically improve your abilities. Maxing out the Peeping Tom, I was able to turn invisible at no cost to Eve as long as I remained immobile. In some respects it feels overpowered, to the point that I rarely felt threatened across the just-under-four hours of my normal difficulty playthrough. In the new 1998 mode, which only allows for non-lethal takedowns, being able to easily slip away feels like a more integral ability. As a whole, Episode 2 feels like the most cohesive Bioshock Infinite campaign. It's certainly more so than Episode 1, which had a hard divide separating its combat and story. But even the main game's action-oriented combat was often at odds with its attempts to present a living world. Here, Elizabeth is always in danger, and always the outsider—creeping unseen through a world she isn't part of. In this, the character and combat are completely in sync. It also helps that Elizabeth is perhaps the most likeable protagonist of the series. As haunted and flawed as any other Bioshock lead, she carries that burden with a sorrow that makes her all the more sympathetic. Over the years, the Bioshocks have utilised elements of horror, mystery, science-fiction and detective noir. In Episode 2, at a character level, it also makes for an effective tragedy. It's let down by an overarching plot that feels inconsequential, despite this episode being significantly more substantial than the first. At times it tips into self-indulgence—specifically with a ham-fisted retconning of the Vox Populi's most controversial story beat. Throughout, this final expansion plays around in plot holes that never needed filling, which makes for an unsatisfying resolution. As Irrational's final work, Episode 2 is a fitting epitaph; both in its ability to offer a fresh perspective on the series, and in the way it obsesses over past triumphs.